Two weeks ago was Ohio’s annual Fan into Flame retreat! A record-setting 250 students and missionaries gathered from over 20 schools in Ohio and beyond. 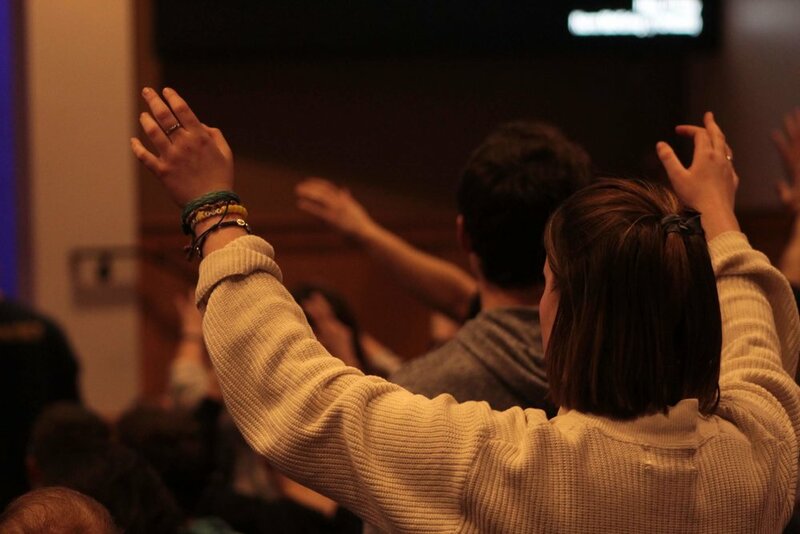 The retreat kickstarts the spring semester with a powerful opportunity for students to encounter the Lord as well as dive into community with other people seeking the same faith life. At the retreat, we heard from students and missionaries as they shared talks and testimonies centered on claiming Jesus as the Lord and welcoming his Holy Spirit to be the leader of your life. Attendees listened to talks, worshiped together, and dove into fellowship with one another. The pinnacle of the weekend was the Saturday night prayer meeting during which the retreat participants were able to pray with one another in small groups for greater outpouring of the Holy Spirit in their lives. Towards the end of the retreat, students shared glory stories about how the Lord worked in their lives that weekend. Emma, (pictured below) shared about how she experienced God’s working in her life that weekend through a wrist injury she received, recognizing it as the opportunity she had prayed for to have more space in her busy schedule to develop a deeper relationship with him. She experienced peace and joy as she surrendered that part of her life to Jesus! This story and the many others shared were just a few of the amazing things the Lord was able to do in the lives of those who opened their hearts to him during the retreat. Moving forward, students and missionaries were re-committed to living their lives for Jesus and boldly seeking his will for their daily lives.